Fire service rescue teams required a boat to save three flood victims from a Moray distillery as torrential downpours left them stranded for more than two hours. Firefighters from Keith and Elgin were called to the incident at Strathmill Distillery in Keith at 10.18pm on Tuesday night after flash flooding caused the River Isla to burst its banks and trapped the three employees inside the main building. A crew of water rescue team members had to use a specialist water raft to paddle into the distillery grounds and evacuate the manager and two operators from the still house just after midnight. The severity of the conditions saw water levels rise quickly in the space of 40 minutes, which caught out the three staff members, but they were able to shut down the distillery power and escape unharmed. 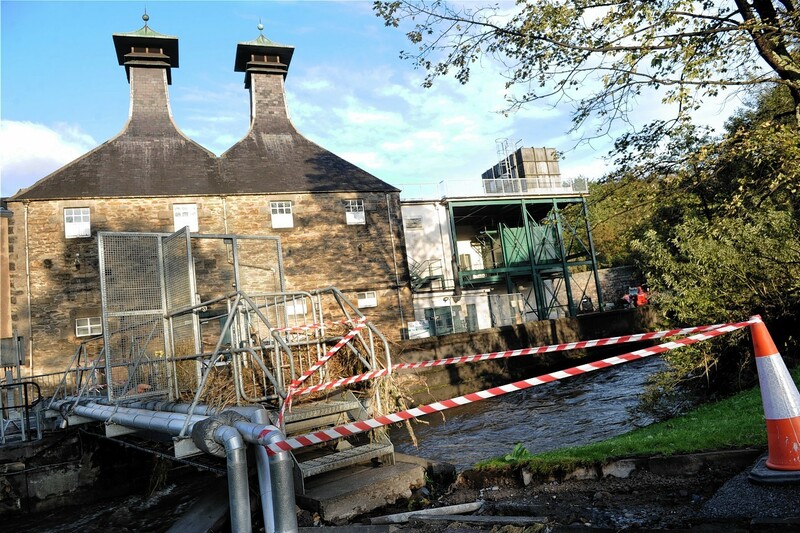 Strathmill Distillery senior site manager, Alistair Abbott, said: “We have had floods before in the area over the years, so we do have plans in place to try to mitigate against these types of dangers. “Unfortunately, this was quicker than normal, but the guys were in high spirits, and they were safe in the canteen up there with a cup of tea. “We have a good group of staff here though, who stick together. They’ve all been back in today to help clean up, and we are looking to get production back up and running as soon as possible. The staff members involved in the incident said they were a bit embarrassed about being rescued and were looking forward to getting back to normal as quickly as possible. Fire crews from Huntly were also called out at 11.50pm on Tuesday where firefighters had to wade in to rescue an elderly couple trapped in their vehicle in the town’s Deveron Way. Local senior officer David Rout, said: “Yesterday was an exceptionally busy period for operational crews and our control staff. “We conducted approximately six rescues over the past 48 hours with no injuries to the public and have been working closely with council staff, police, coastguard and emergency planning teams based in the area.